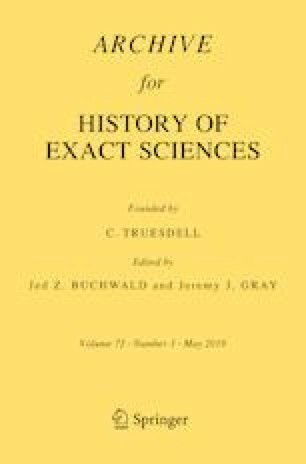 In this paper, I propose the idea that the French mathematician Michel Chasles developed a foundational programme for geometry in the period 1827–1837. The basic concept behind the programme was to show that projective geometry is the foundation of the whole of geometry. In particular, the metric properties can be reduced to specific graphic properties. In the attempt to prove the validity of his conception, Chasles made fundamental contributions to the theory of polarity and also understood that a satisfactory development of projective geometry has to overcome the specificity of that theory itself. In this perspective, he developed his ideas on duality and homography, showing their dependence on the concept that he was going to pose at the basis of geometry: the anharmonic ratio, today called cross-ratio. The conceptual itinerary that starts from Chasles’ studies on polarity and ends with his results based on the cross-ratio represents the itinerary of his foundational programme. I will follow this complex and interesting line of thought, place it in the context of what was then called descriptive geometry, and outline a connection with the later great results of Von Staudt, Cayley, and Klein. I wish to express my gratitude to Professor Jeremy Gray for his precious advice and commentaries during the revision of this paper. I am profoundly grateful to Professor Gianluca Gorni for his valuable help and expertise in drawing the diagrams here presented. I am grateful to Professor Ciro Ciliberto for his tips concerning the general structure of this paper. Obviously, any possible mistake rests entirely upon me. I would also like to thank the anonymous referee for several useful comments.